Cenotes dot the landscape throughout the Yucatan Peninsula. Explore one or more of these amazing cenotes for a truly unique experience on your vacation. 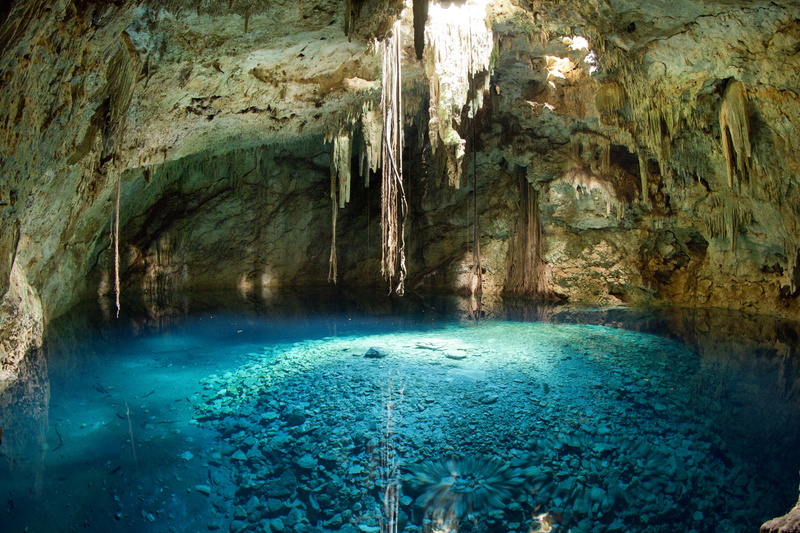 There are literally thousands of Cenotes, or natural caves that are filled with fresh water, in Mexico’s Riviera Maya. These underwater sinkholes were are formed millions of years ago when limestone caves collapse, revealing underground pools and today lucky travellers can take a dip in some. So how do you find a cenote? Some Cenotes are unmarked and people just stumble across them while exploring the jungle, and others, like Rio Secreto, are massively developed and include tours and meals. Many of the popular ones can be seen while on tours. Many of the Cenotes have a small entrance fee, ranging from US $5 to $10 per person per day, or can typically be booked on a tour locally at the hotel. While some do have restaurant facilities, it’s always a good idea to pack a cooler with food and drinks when you head out for the day. Water shoes (as opposed to flip flops) are a very good idea for safety and comfort. Also, if you can, it’s best to bring your own snorkel gear so you don’t have to rent it on site. When visiting the Cenotes, be sure to respect the posted signs. 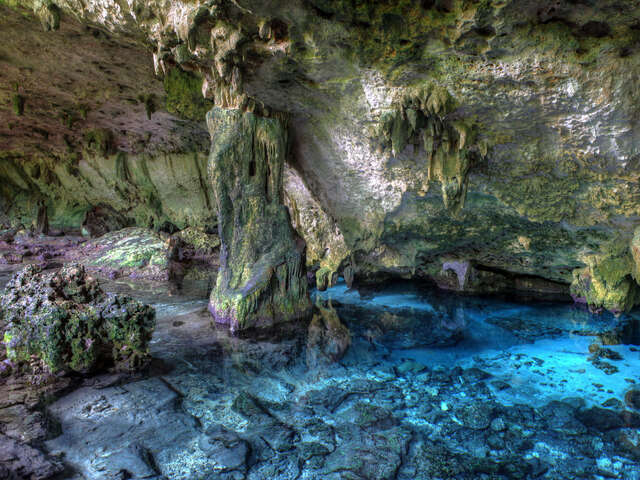 Most Cenotes do not allow sunscreen, creams or lotions of any kind in the water as it causes massive damage to the natural underwater ecosystem. Bugs, especially mosquitos, can be bag around some of the Cenotes, yet most don’t allow insect repellent to be worn in the water. Again, please respect this. You can spray yourself once you exit the water. Snorkeling in a Cenote is a fun and unique way to see the unique underwater life. We can’t list them all here, but we can tell you about a few of our favorites. 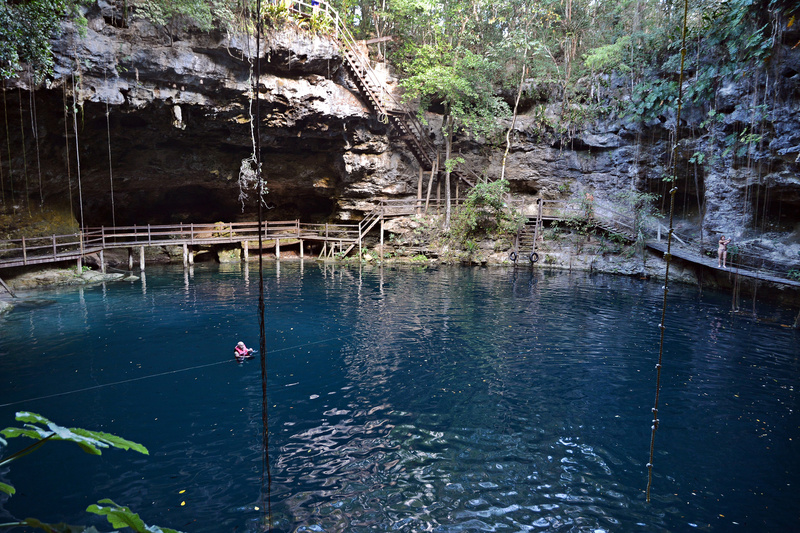 Gran Cenote is simply a must see. Located just outside of Tulum, it is well marked and easy to find. Head into Tulum town on the 307 highway and take a right at the second stop light (this is the main road to Coba). A short way down the road you will see the Gran Cenote on your right. Here you will find changing facilities, bathrooms and a small restaurant on site. 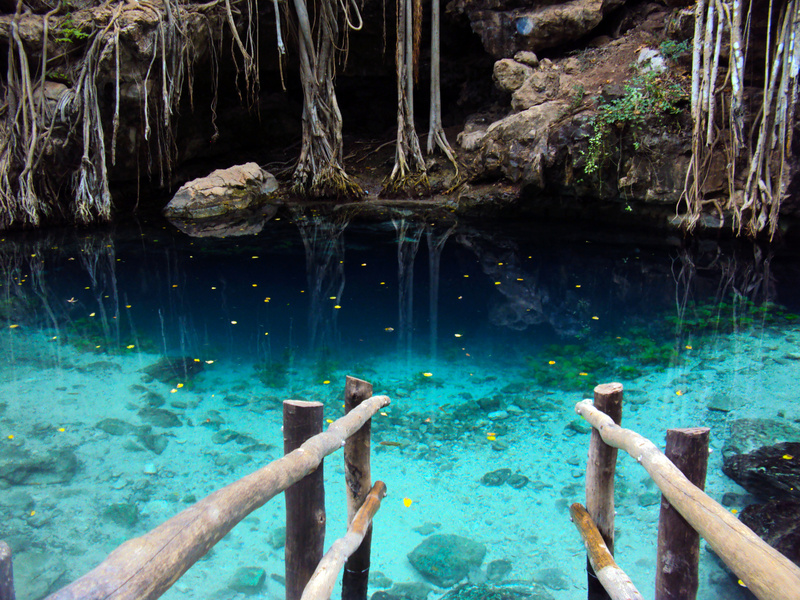 The water here is crystal clear and you’ll find impressive stalactites under water along with fish and sea turtles. A visit here is often included on tours to Chitzen Itza. At 26 meters (85 Ft) below the surface, Ik Kil is one big hole in the ground. The water surface with a diameter of 200ft is so deep, 40 meters (130ft) that no one has ever hit their head on the bottom and diving is allowed. A circular staircase has been carved out of the limestone making for an easy walk down to the water. There are access windows carved out in two spots on the way down affording great views for pictures. 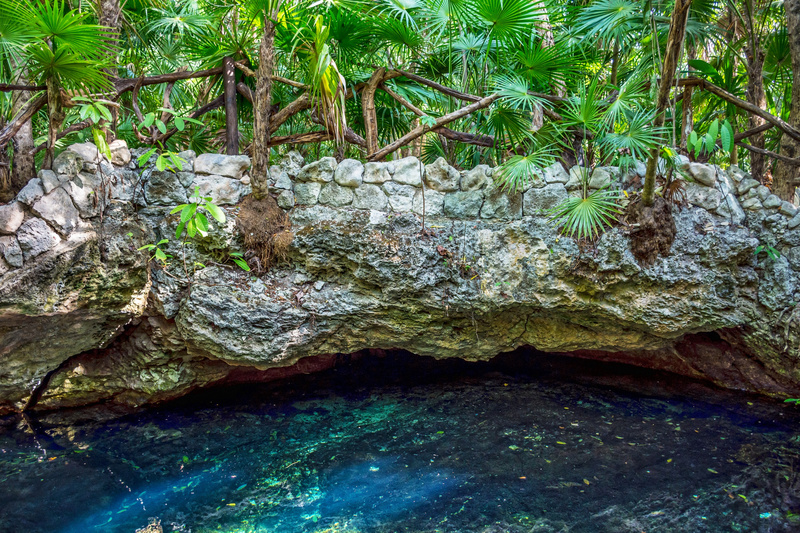 Located across the street from the Xel-ha water park, Dos Ojos consists of two connected sinkholes with a large cavern between them (accessible only if you’re scuba diving here.) If you plan on snorkeling, enter the 2nd Cenote (the one on the right) and take an immediate left at the bottom of the stairs. Walk until you find a nice entrance point for snorkeling, one of two wooden decks with stairs. It does get crowded to try to get here early in the day if possible. After you’ve explored the Dos Ojos Cenote, relax in one of the hammocks on site and enjoy a picnic lunch. 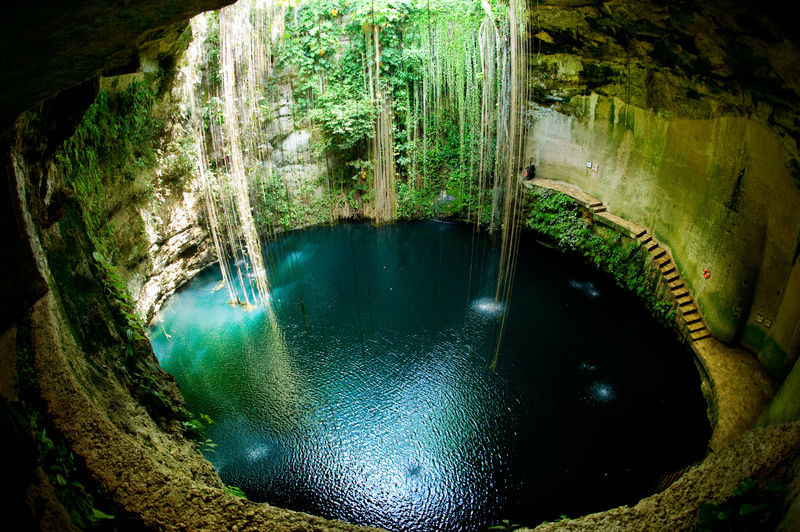 This beautiful Cenote is located about 3km south of Puerto Aventuras. After arriving at the Ponderosa El Eden Cenote, you’ll walk on a short path that takes you to the Cenote. Be sure to bring your own food and drink as there is no restaurant on site. Ponderosa El Eden has a large island in the center of it. Kids love climbing up the large tree in the middle of this island and jumping into the water. Enjoy unlimited visibility under the water, and a wide variety of fish, eels, turtles and plant life. Located across the 307 highway across from Playa del Carmen (at Av. Juarez), to reach Chaak Tun head past the guard and continue about 5 km to where the dirt bumpy road begins. Chaak Tun is best visited after 1pm, when all the large tour groups have finished their morning tours. Included in the price of admission is a safety helmet and life jacket. Walk down a few hundred feet through a well-kept wooden walkaway to where the cave opens to a small courtyard with tall trees that rise into the jungle and with a variety of birds, singing and making different sounds. While snorkeling keep your eyes peeled for a stone replica of the famous Virgin of Guadeloupe at the bottom of the water of the Cenote. It's not quite in the Riviera Maya, but still worth a mention. The Xcanché cenote is located 1.5 km from the archaeological site of Ek Balam, to reach the can make trucks and / or type mountain bike. This site is operated by a cooperative indigenous Mayan and offer services such as ecotourism hikes to admire nature in the region, camping area, zip line, rappelling, composting toilets, a rest area with hammocks and a restaurant with regional cuisine of Yucatan. Want to learn more about these underground wonders? 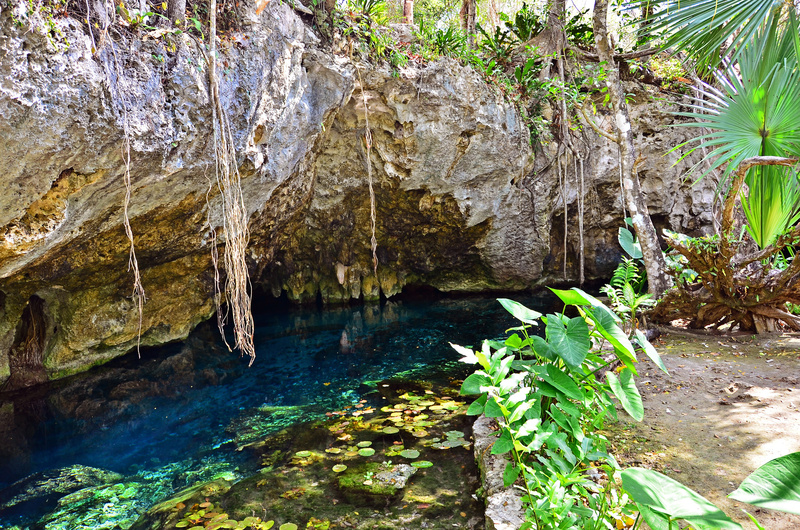 If you are keen to learn more about the geology of Cenotes on an organized tour, you may want to consider Rio Secreto. While this option is more pricey than the “do it yourself” options listed above, adults are US $80 and children are half price, the 3 ½ hour tour offers a bilingual guide, equipment and they even serve you lunch after! Rio Secreto is actually a series of Centoes connected by an underground river. Located 5km south of Playa del Carmen, simply look for the highway signs that mark the turn off. You can visit Rio Secreto on your own, or more popular is booking an all inclusive tour right from your hotel. Ready to book your trip to Mexico's Riviera Maya? Give your UNIGLOBE travel Expert a call today.